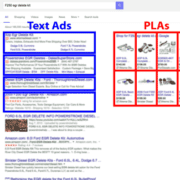 This AdWords research covers searches conducted by consumers searching for parts and accessories for their trucks. Search on mobile devices dominated truck search activity, growing an amazing 60% from 2014 in the third quarter according to a Google search metrics report (scroll to the bottom to download your own free copy of the full truck research report). Overall search queries grew by 26% including mobile, desktop and tablets. These are search queries for parts typically sold by members of SEMA and the Auto Care Association. If you have a website selling truck parts & accessories online, the clear message here is your site better be mobile-friendly or you are missing a huge opportunity to be found. The truck research report shows mobile clicks doubled from 2014. This AdWords report is for online search performed on Google, for truck parts and accessories, in the 50 US states. 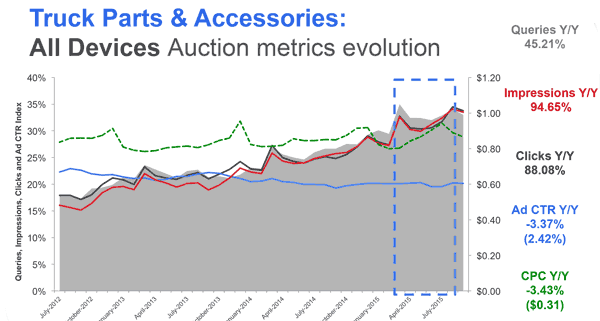 Search activity for truck parts is showing aggressive growth with overall queries growing 34% and impressions growing 32%. 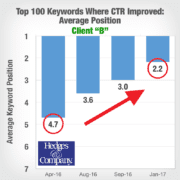 The average click through rate (CTR) is showing slight growth from 2014 and is up 2%. Looking closely at Google’s reported CTR, the average off-road CTR for desktop searches grew 3% while mobile CTR actually dropped 5%. 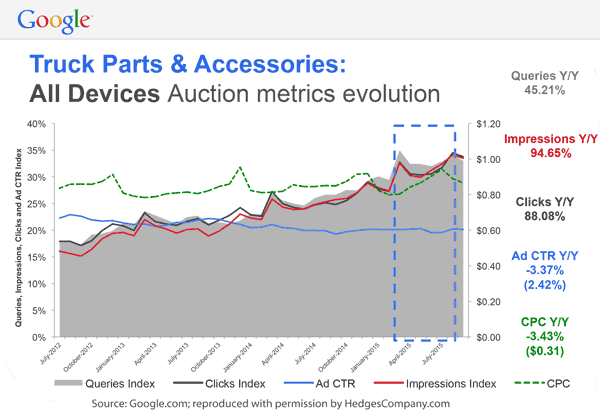 An important trend is overall cost per click: truck parts and accessories CPC averaged $0.90, with desktop even higher at $1.14. Clearly many online marketers are overpaying for clicks which underscores the need to fully optimize paid search campaigns. The third quarter om 2-15 saw an increase in overall Cost Per Click (CPC) of 6% from 2014. Most of this rising CPC trend is driven by by mobile CPC, which jumped 20%. Google has the biggest truck market in the world, much larger than all truck paper magazines combined. 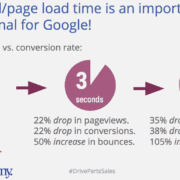 A marketer can reach truck enthusiasts right when they’re making a buying or brand decision. Plus, online advertising on Google is more cost-effective than print with the added benefit of being 100% measurable. The online truck market is growing at a rapid rate, too. Download your free copy of the Google truck research report, courtesy Google and Hedges & Company. Just click on the link below. The 11 page PDF file is around 400KB so it downloads to your computer quickly. No registration is required. Download your own free copy of the Google Parts & Accessories truck research report. Google logo © 2016 Google Inc. All rights reserved. Google, Google Partners and the Google Logo are registered trademarks of Google, Inc. Hedges & Company is a Google Partner Agency serving the truck aftermarket.